Keep Britain Tidy. And Other Posters from the Nanny State is a book of posters from The National Archives that contains more than 40 examples from the 1940s to the 70s. Each poster is printed the full size of the page, on thick paper with an information caption on the back, making it detachable for display on a wall. The contents show a cross-section of mid-twentieth century poster design, with work by designers including Jan Le Witt, George Him, Aubrey Rix, Reginald Mount, Eileen Evans, Abram Games, Royston Cooper, Stan Krol and Hans Unger. Hans Unger, Don’t Drop Litter, 1966. 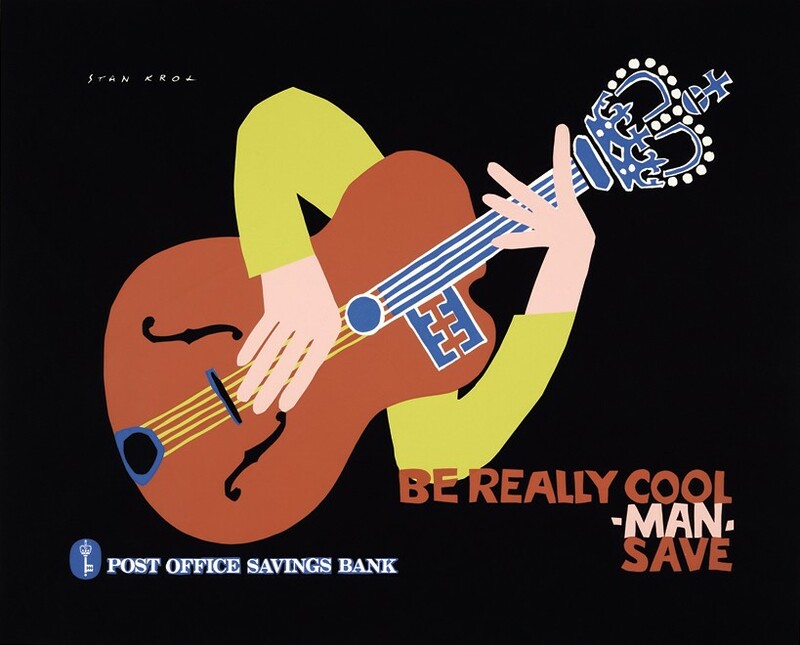 Top: Stan Krol, Be Really Cool, Man, Save, 1964. All images in this article courtesy © The National Archives. A variety of artistic approaches can be seen. Some posters use representational illustration, while others mix sketches with photography, or photographs with collage. Many feature simple graphic cartoons. 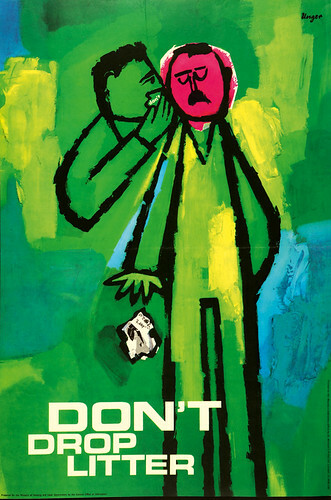 Earlier examples tend to be in black and white or muted colour, but later ones employ vivid colour for added impact, for example Hans Unger’s 1966 poster, Don’t Drop Litter. 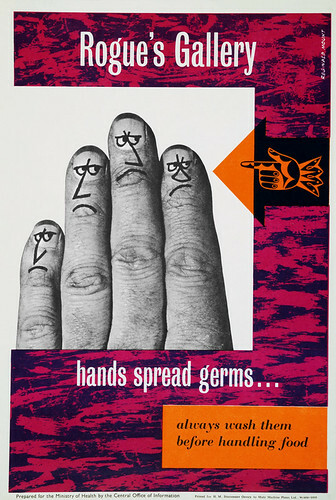 Humour is a recurring device, from the anti-waste campaign highlighted in The Woman Who Wouldn’t poster in the 1940s, to Reginald Mount’s Rogue’s Gallery of disgruntled finger-puppet germs in the 1960s. The former even features a witty four-stanza poem – which interestingly anticipates a current campaign on the London Underground (illustrated by MacBess) that uses short poems to encourage considerate behaviour. 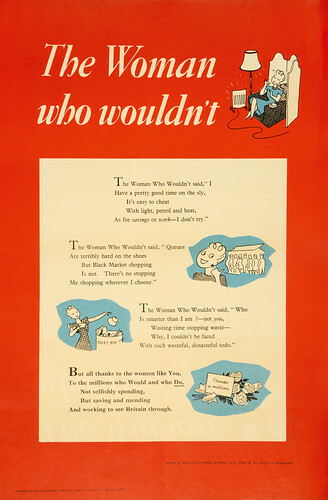 The Woman Who Wouldn’t, late 1940s, for HM Government. Designer / copywriter uncredited. Reginald Mount, Rogue’s Gallery, 1960s, for the Ministry of Health. The ways that text and image work together vary considerably. Some health posters include long wordy explanations, from rules for a happy smile to advice on hygiene (‘clean underwear once a week’). Other more snappy designs incorporate pithy rhymes and memorable catch phrases. Some slogans have endured over the decades, such as the familiar ‘Coughs and sneezes spread diseases’, first used in the Second World War. Others are long forgotten, for instance, ‘It’s finer remember in June and September’ for a 1950s campaign to stagger summer holidays. The posters are fascinating historical documents, too. One, urging citizens to eat potatoes instead of bread, reminds us that bread wasn’t rationed until 1946. Another spells out the danger of venereal disease in servicemen returning from the Second World War. A third, from 1963, reflects the slowly emerging understanding of the link between smoking and lung cancer in the wake of the ‘Smoking and Health’ report of 1962. 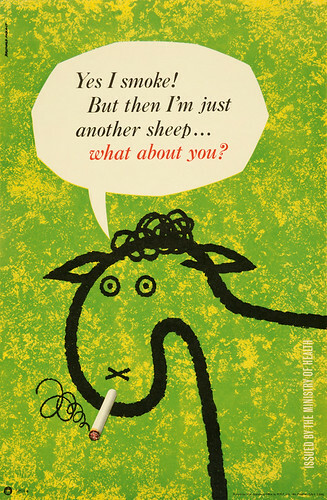 Reginald Mount, Yes I Smoke!, 1963, for the Ministry of Health. This collection documents some of the social goals that, over recent past decades, ‘the gentleman in Whitehall’ has considered important to promote. 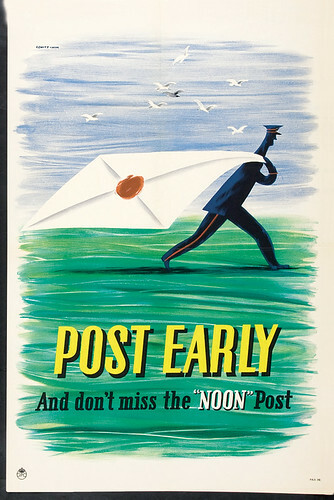 Whatever your political position on the ‘nanny state’, the posters of Keep Britain Tidy provide a fascinating glimpse of postwar British culture. 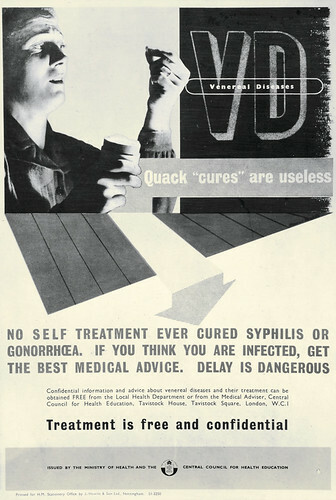 Venereal Disease, Quack ‘cures’ are useless, 1948, in a photomontage style similar to other VD posters made at this time by F. H. K. Henrion. Jan Le Witt and George Him, Post Early, 1940s. 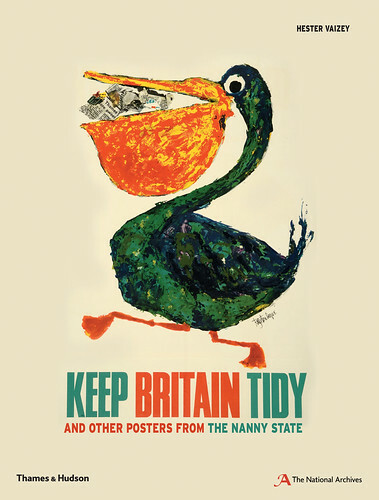 Cover of Keep Britain Tidy (Thames & Hudson, 2014), featuring poster of that name by Royston Cooper, 1965.